I am sure that when State Representative John Atkins thought up the idea of toll roads, as opposed to a gasoline tax increase, I am sure he thought it was a show of conservatism. Sorry to bust your bubble Mr. Atkins, it is anything but. On the Dan Gaffney Show, on Delaware 105.9, Rep. Atkins proposed, for the second time, that Delaware create toll roads in Sussex County to make up for revenue shortfalls. Mr. Atkins stated that he sees the tourist in his district headed for the beaches where they tie up our roads and waterways, and that a toll of $2 one way, or even both ways would be a better idea than a ten-cent tax increase on gasoline. Let me be clear, I too am opposed to the gas tax increase. Mr. Atkins seems to feel that toll roads would only be used by tourist and would not cost Delaware residents anything. I will look at that a little later, but right now let us look at where Mr. Atkins proposes to establish this toll road, to tax revenue heaven. Mr. Atkins’ district is centered around Millsboro, so one might believe that he would be talking about creating a toll road there, but you would be wrong. No, it seems that Mr. Atkins has chosen Rt. 404 west of Bridgeville as the best place to set up a toll booth. One might notice that Mr. Atkins has chosen the place in Sussex County that is about as far away from his district and his constituents as one can get, and stay in the county and state. Mr. Atkins says he is against the gas tax increase that Gov. 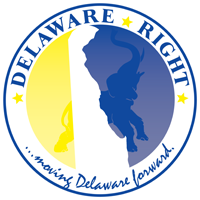 Markell has proposed because it would hurt the working class citizens the most, and in the same breath he proposes a tax on the ability to use an existing road, and couches his argument in saying that it would mainly affect tourist and not Delaware citizens. Where to start Mr. Atkins at taking this silly idea apart? Well let’s start with the Del. DOT Secretary’s statement that it would be against federal law to create a toll road on Rt. 404 without making major renovations to the road. Now Mr. Atkins, who do you suppose would be paying for those renovations up front? Delaware tax payers, that’s who. And how long would it take the toll road to pay for those renovations before the state began to see any revenue return? Maybe never, since any revenue from the toll road would likely be offset by the upkeep cost. Let us also not forget that this would create more state employees. And the history of toll roads is that the tolls always increase over time. Now there is a conservative idea if ever there were one Mr. Atkins. I would say, that alone would cost the citizens of Delaware, not the tourist. Now let us also look at the feasibility of turning 404 into a toll road from a logistics point of view. Toll roads are usually set up at choke points like the Bay Bridge, where going around is longer and more expensive than the toll charged. Or they are limited access roads like Rt. 1, where entry and exit are controlled to force people towards the toll gates. Now either Mr. Atkins has never ridden on Rt. 404, or he has some grand idea how to make it work as a toll road. Rt. 404, from the state line east towards Bridgeville must have close to a hundred intersections, roads that would allow people to enter and exit, and circumvent the toll booths. And since we have no control over Maryland there would be nothing to stop people from entering Delaware after the toll, or from another road. Which leads to another problem that Mr. Atkins must have ignored, or completely missed in this dream like scenario. If 404 where turned into a toll road it would force many people to use the secondary roads, turning the shortest routes around the toll booths into unlined, no shouldered race tracks. A safety nightmare for families that chose to live on these roads for the very reason of avoiding traffic past their front doors. Let us again look at Mr. Atkins’ claim of this idea only affecting tourist. Really Mr. Atkins? If you knew anything about this area, which you obviously don’t, then you would know that many people in this outlying area use 404 to go to Bridgeville and Seaford to shop and work. You idea would cost them maybe $2, or $4 just to run in for a gallon of milk, or as stated above, be forced to use back roads for what should be a quick and safe trip. Maybe if Mr. Atkins is really so interested in taxing only the tourist who go to the beach, then maybe he should take a lesson from New Jersey. Maybe he should propose putting up fences along the board walks of the beaches with turnstiles to charge people ten dollars a day to sit on the beaches. Or here is an even better idea Mr. Atkins, if you really believe that toll roads are a good idea, then propose one for your district where the people who vote for you will either be inconvenienced or forced to pay the toll. How about a toll booth right in the center of Millsboro at the light, why Mr. Atkins could even take a shift in the booth to save tax payers some money. Or better yet, we could get Mr. Atkins a little uniform with a hat and a badge, and one of those mechanical coin change makers that hang on your belt, you know like the one Goober Pyle wore, and when the light turns red, Mr. Atkins can trot out to the cars and collect the toll like the beggars in Baltimore. Maybe Mr. Atkins is just desperate to seem conservative and to be in opposition of the gas tax, while trying to appease his Democratic masters. Not working Representative Atkins, not working. 5 Comments on "You Shall Not Pass!" Raising the existing tolls or adding new ones might be done without effecting DE residents. With the EZPASS, discounts are offered to residents in other states. Maybe we could raise the tolls on Route 1 to $2 all the time, but DE residents would be charged only $1. Cash customers just show a DE license. Worth looking into? Yes, that would be worth looking at. The toll road idea is ridiculous. As an aside, I have always had to go to N Va frequently. Unless you live out 24 or 9, the fastest way to the Bay Bridge is 14- you come-out at the Denton Bypass- 16 is good but 14 is better. Here is another question for Mr. Atkins, if it is required by federal law to make major renovations to 404 before it can become a toll road, and we know that any such renovations will require years of impact studies, plus all of the people in the area fighting it, and then years of actually making the renovations, how does a toll road 15 or 20 years down the road solve our current budget issues? Mr. Atkins? Hello! I know you read this, I know you have responded on FB. No, what this is, is a man who came damn close to losing an election, who is now trying to have it both ways. He is trying to look like he is conservative by opposing the gas tax increase, while trying to look smart by proposing this silly impossible toll road idea. Look “Anonymous”, wink wink, it really doesn’t matter who uses the road, though a lot of locals do, the fact is that it would be next to impossible to make this happen, and if you did, then the cost to tax payers would be through the roof, with no real pay-off in the end. Beach ‘regulars’ know about 16, but occasional visitors (the majority) don’t. One reason is that the 16 exit off 404 (flashing yellow) says “Greenwood,” so a lot of people don’t know that it goes all the way to Rt. 1. Does anybody know what a GPS says at that intersection (404/eastbound 16) if the destination is Lewes or Rehoboth? In any case, I oppose the toll road. Maybe legalize prostitution at casino hotels.